WR Keenan Allen vs. CB Steven Nelson – Allen has looked like someone who simply can’t be defended during the Chargers’ hot streak. He has run 49.8 percent of his routes from the slot this season, and his 451 receiving yards from the slot is tied for ninth among the 63 wide receivers with 90 slot routes through Week 14. Steven Nelson, who has been the Chiefs’ primary nickel corner since Week 8, has allowed 1.83 yards per cover snap in the slot, which ranks 48th out of 53 cornerbacks (min. 90 cover snaps in the slot). Nelson has also allowed the ninth-ranked passer rating (109.4) in the slot. T Joe Barksdale vs. Edge Justin Houston – Barksdale has yet to allow a sack this year, but he will face a tough task this week in blocking Houston. On the year, Barksdale has allowed just 15 pressures (one hit, 14 hurries) on 277 pass-block snaps. His pass-blocking efficiency rating is 95.9, which is tied for 18th out of 57 qualifying offensive tackles. Houston, who has three elite overall grades in his six-year career (2013-2015), has 43 total pressures from the defense’s left side (10 sacks, five hits, 28 hurries). Houston has an 11.1 pass-rush productivity rating from the left side, which ranks 27th out of 105 edge defenders. TE Hunter Henry vs. LB Derrick Johnson – Henry’s emergence continues, as he now holds the top overall grade among tight ends this season (88.5). He has gained an average of 2.14 yards per route run, which ranks third out of 39 tight ends. However, Henry will be facing one of the toughest challenges of his career this week. Roaming the middle of the field will be Johnson, who has long been one of the best coverage linebackers in the game. On the season, Johnson has allowed just 0.32 yards per cover snap, ranking first out of 49 inside linebackers. Johnson’s tight coverage has also made him the second-least targeted inside linebacker, as he has seen a target just once every 12.1 cover snaps. 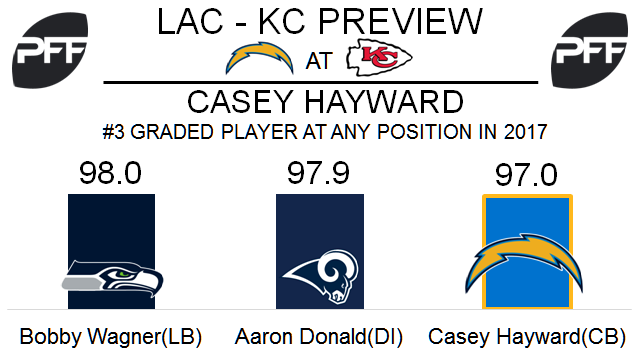 WR Tyreek Hill vs. CB Casey Hayward – This will be an interesting matchup between one of the fastest players in the NFL and the highest-graded cornerback this season. Hill is third among receivers with a 126.0 passer rating when targeted. He is second with 479 yards receiving on deep passes (targets 20 or more yards downfield), and his five touchdowns on deep passes is also second. Hayward is the top-graded cornerback this season with a 97.0 overall grade and the third-highest graded player at any position. His 97.2 coverage grade is the highest of any player. Hayward leads all cornerbacks with 13 passes defensed and is fifth with a 49.9 passer rating allowed when targeted. T Eric Fisher vs. 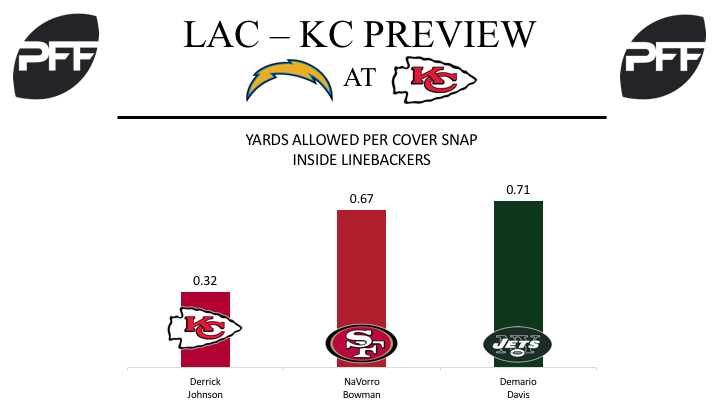 Edge Melvin Ingram – The Chargers have the two highest season-long pass-rush grades among edge defenders in Ingram and Joey Bosa, so the Chiefs’ offensive line will be tested in Week 15. Fisher is ranked 34th among offensive tackles with a 73.6 overall grade. He has not been very effective blocking in the running game, with a 49.0 run-blocking grade that ranks 53rd of 79 qualifying tackles. Ingram is the eighth-ranked edge defender this season with a 91.3 overall grade. He is 10th in pass-rushing productivity (pressure created per snap with weighting toward sacks), with nine sacks in 396 pass-rush snaps. RB Kareem Hunt vs. LB Denzel Perryman – Hunt rebounded from a mid-season lull with a strong performance in Week 14, including two breakaway runs (15 or more yards), marking his first breakaway run since Week 9. He is the fourth-ranked running back in terms of overall grade at 86.0. Hunt leads all backs with 64 missed tackles forced and is 11th with 2.94 yards after contact per attempt. Perryman was activated from injured reserve in Week 10 and has provided a boost to the Chargers run defense. He ranks third among linebackers for Weeks 10-14 in run-stop percentage at 14.9 percent (plays resulting in a “win” for the offense). Perryman’s 70.4 overall grade is 43rd of 88 qualifying linebackers this year.